Instagram is a bit complicated. But if you want to grow it all comes down to your photos. 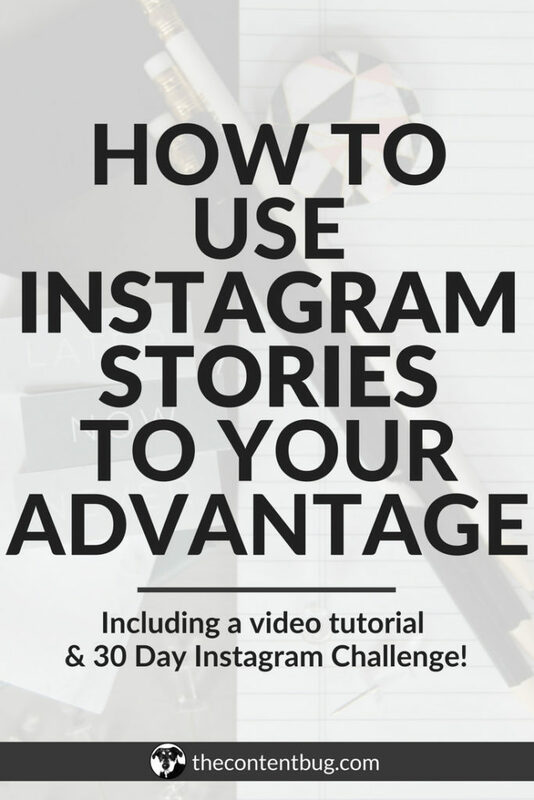 If you don’t have amazing photos, then you won’t see amazing results on the platform. But what happens when you’re a one man (or woman) team? You don’t have someone there with you all the time to take photos of you. And you don’t just want to wait around for a stranger to walk by or a friend to have time to fit you in their schedule. Sometimes, things just need to get done! And you have to take your Instagram account into your own hands. 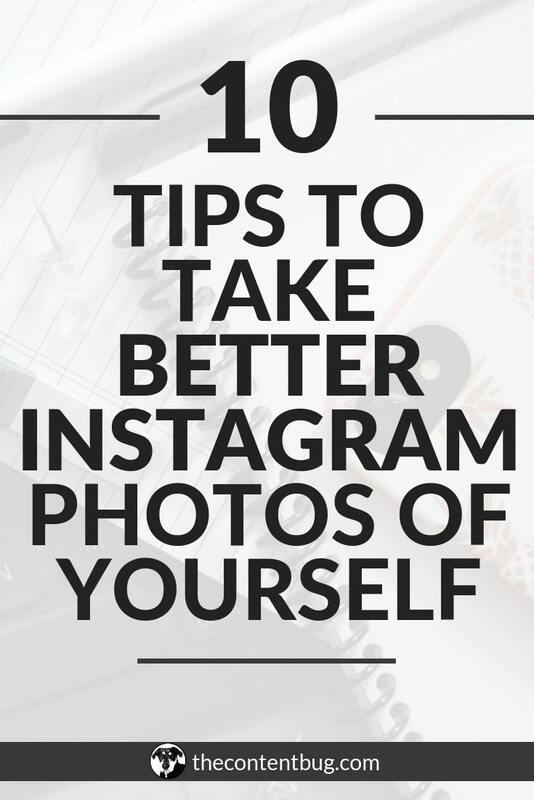 So today, I want to talk about how you can take more Instagrammable photos of yourself by yourself! I’m talking camera on a tripod, self-timer images that actually get likes. I take all of my own Instagram photos. ALL OF THEM! So all the photos you see of me in my office, all the flat lays or desk images, all the coffee shop shots, those are all shot by yours truly. Psssst. If you don’t follow me on Instagram, wyd?! I share a ton of other tips you might enjoy. Now I have to say, I am a photographer. I went to college and majored in Photography (and marketing, but that’s boring). So I know a thing or 2 about how to work a camera. I’ve been doing self-portraits since I got started in the arts. So taking a million shots to get the perfect one is normal to me. And I’m blessed because I already had all the equipment I needed to take my own IG photos once I started TCB. So let’s talk about the equipment part. Because that’s huge. There are a few things that I swear by! If you don’t have a fancy camera, I wouldn’t stress out so much. The cameras that come of phones these days are amazing. And they just keep getting better and better! So your iPhone will work just fine. But if you’re curious, I use an old Nikon D80 camera to shoot the majority of my photos. But some of them are taken from my phone (like this one). Having a high-quality camera can really make all the difference in making your IG photos look better. Most people are including a lot of detail in their images and increasing the structure during the editing process. So a good camera will just make it so your images don’t appear grainy. Whether you use your phone or a DSLR camera, you need a tripod! Something that you can take with you just about anywhere. This is especially important if you want to take IG pictures around town. If you can compress your tripod so it’s easy to carry, it will make your life a heck of a lot easier. This isn’t 100% necessary. But it will make taking batches of photos easier. With a shutter release button, you don’t have to keep running to your camera every 10 seconds to start the self-timer. Instead, you hold a small remote in your hand and push the button any time you want to take a photo. Again, this isn’t a must. But I don’t know what I would do without this bad boy! When I take photos on my DSLR, I hate when I have to upload them to my computer to then airdrop them to my phone. It’s just a waste of time. So thankfully, I have this converter which allows me to upload all of my images on my phone! Since this is where I do all of the editing on my IG photos, it just makes sense. But if you edit your photos on your computer, then keep doing what you’re doing. 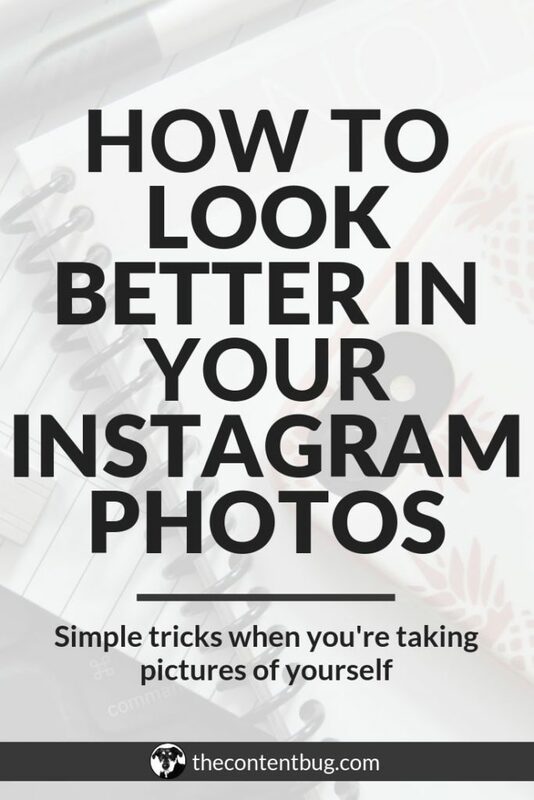 Now let’s actually get to the part where I share my tips on how to take better photos of yourself. I’ve got 10 of em. So stick with me here. Before you even break out the camera, you need a mirror. 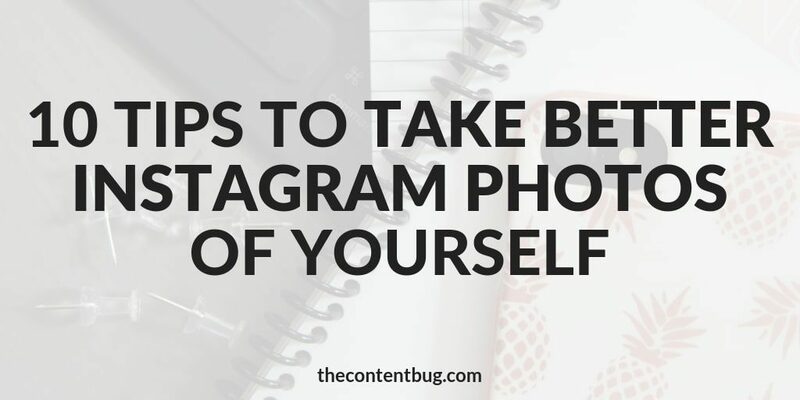 When you first start taking your own Instagram photos, you’ll quickly realize what poses look good and what ones just don’t! So especially if you are planning on shooting photos in a public location, then you’ll want to know your poses ahead of time. No one wants to embarrass themselves here. And this is where you mirror comes in. Stand in front of whatever mirror you got and strike a pose. It’s better if you have a full-length mirror so you can practice the complete stance (this will come into play on tip #2). Try moving your head, positioning your legs differently. What happens when you play with your hair, hold your lips in a new way, or pop out your hip slightly. All of these things may seem so minor but they could make a big difference in your photo! I recommend practicing your poses any time you can. In the bathroom at a restaurant, while you’re brushing your teeth, sitting in traffic, quick glances on those pillar mirrors that clothing stores have. This is something I didn’t do for a long time. But a few months ago, I realized that all my favorite successful influencers/Instagrammers included their whole body in the image. I’m telling you. 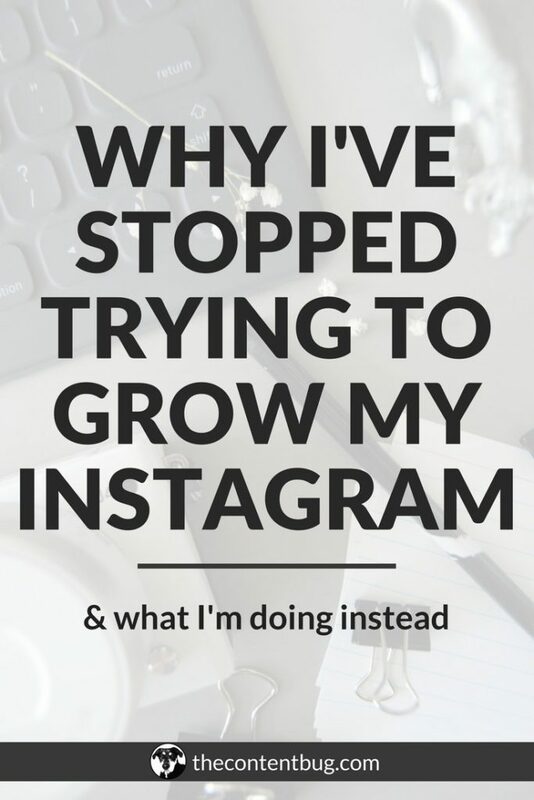 Go take a look at some successful Instagram accounts and tell me what you find! You’ll see people who have full body shots! So if you want to be a real Instagrammer, you need to include the whole body, head to toe, in the image! 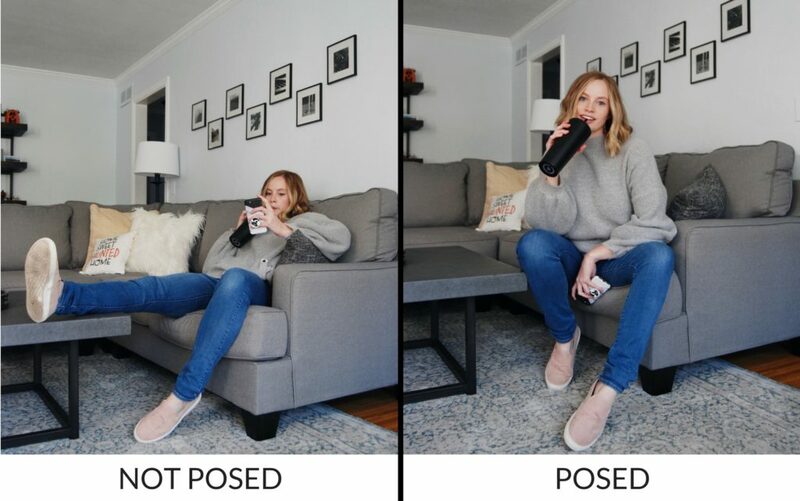 That means placing your tripod farther away from you and really working every part of your body. I never really understood having a side. But now that I take photos of myself almost every day, I’ve noticed that I have a side. For some reason, I like the left side of my face better than my right. Weird. But true. I also started to notice that I would do the same poses over and over again. Because once I knew what worked, I just stuck to it. Until one day I got a DM from someone that was sharing new pose ideas with me. It’s important to know your angles to make sure you’re taking the best photos of yourself possible. But remember to mix it up! You’ve got to mix up your poses. But you also have to mix up your location. If you aren’t shy and you’re willing to take pictures of yourself in public, then you don’t have to worry so much about this! You have the whole world available to you! But for me, my branding is really my work. Everything I talk about revolves around my work. So for a while, I thought that all of my photos had to be in my office. Now to be completely honest, my office is SMALL! I’m talking about maybe 10 ft by 10 ft.
It’s tiny. And there isn’t much space to work with. So I had to learn to step outside of my office to get shots that still matched my brand but made the photos look a bit different. No one wants to see the same photo over and over again. Change your pose and location and you’ll start to notice that people take you a bit more seriously on IG. The best tip I can give you is to tape your camera’s flash shut. 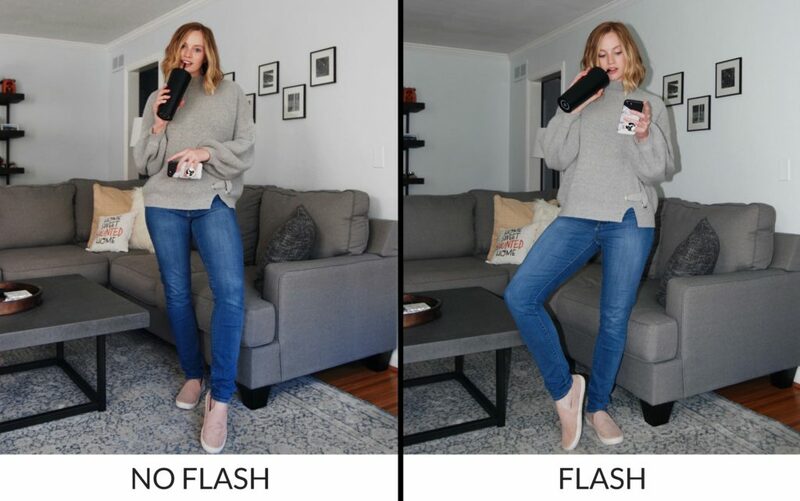 You never want to use the flash from your camera when you are taking pictures! It’s just too harsh and can make you look crazy sometimes. So when you can, use natural lighting! Stand near a window or just go in a well-lit room. Instagram photos that are bright and light tend to perform better on Instagram. But if you don’t have a room with good lighting, there are 2 things you could do: use studio lighting or move outside! If you’re taking your IG photos outside, you need to be careful to avoid harsh lighting. You know that 12 pm, sun blasting from overhead, terrible nose shadow? Yeah. We want to avoid that! From 10 am to 3 pm is probably the worst time that you could shoot your IG photos. This is when the sun is the highest in the sky and when it’s the harshest when it comes to contrast and shadows. If you want to take really high-quality Instagram photos, you’ll quickly learn to love the golden hour and overcast days. The golden hour is when the sun is getting ready to set at night. It’s highly talked about as the best time to take photos. But if you don’t want to leave it to the chance of catching the sun at the right moment, your best bet is to shoot on an overcast day. Lots of clouds in the sky and little sunlight is your best friend. But I’m not talking about a dreary, dark cloudy day. There’s an important difference there! Got it? With Instagram, you can upload vertical images, horizontal images, or square images. 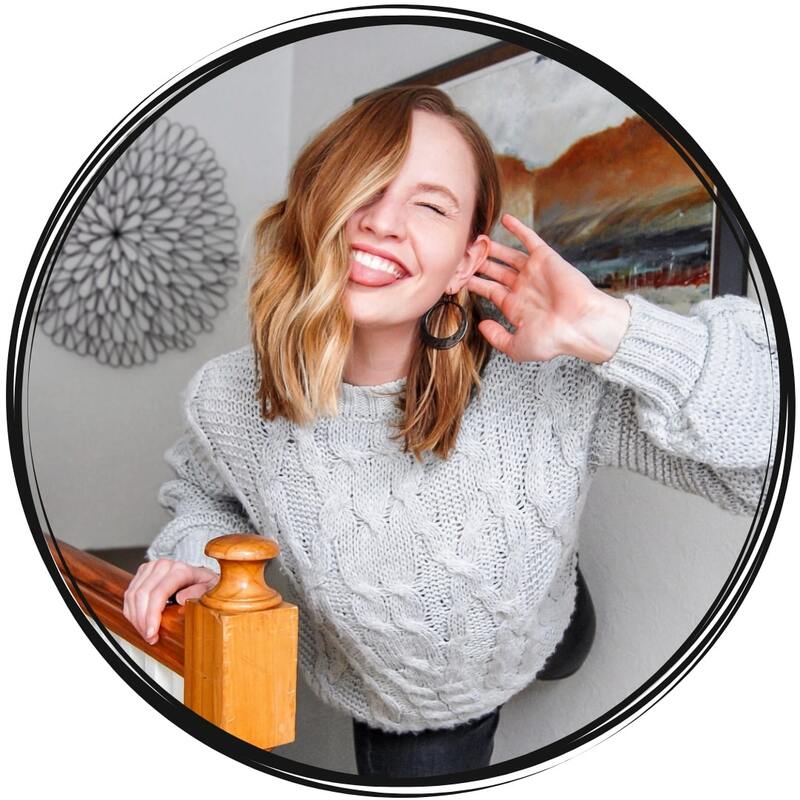 But again, this is a good time to take a look at the successful Instagram accounts that you like to follow. I’m willing to bet that most of them share vertical or square images. And if you want to include square images, I still recommend shooting all of your photos portrait style. Meaning vertical. 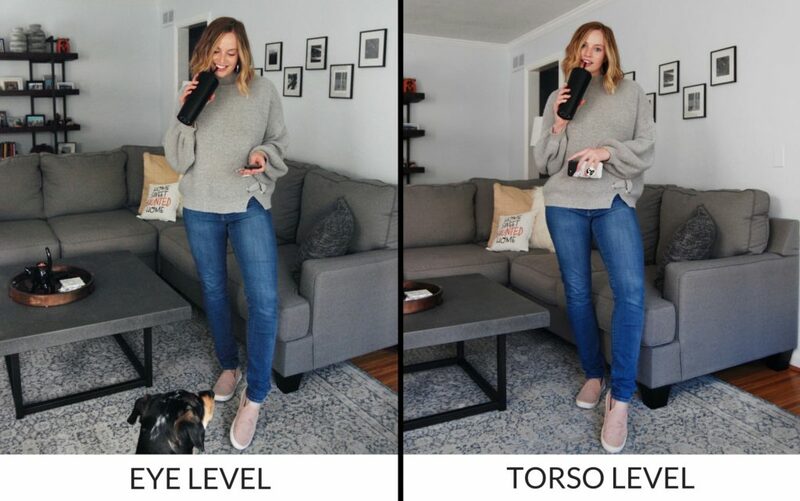 This will make it much easier to get your whole body in the image. And honestly, it just looks nicer! Plus it takes up more space on Instagram when people are scrolling so you can really get their attention. So just trust me on this one. This is an amazing tip if you want to look taller in your photos. And even if you don’t want to look taller, this will just do a little somethin’ somethin’ to make your photos look better. When you’re setting up your tripod, you don’t want to raise it to eye level! I know that’s what makes sense. But that’s not the best way to do it! You may notice that other Instagrammers have their photos taken almost at belly or chest level. This way the camera is straight on with them. And it’s so hard to describe but this really makes the world of a difference! You want to position the camera where you don’t have to tilt it up or down. You want it to be level with the horizon and facing level toward you. And if you’re trying to get that full body shot, that means positioning the camera lower than seems natural. If you don’t believe me, just try it on your next photo shoot. You might be surprised. Don’t get me wrong, it’s still about the pose! But a lot of Instagram photos these days are a bit more natural and candid. And if you want to get a real shot where you don’t seem so stiff, move around! When you’re clicking the shutter release button, always be moving. Never stand in one place too long. And don’t get too committed to a pose. Some of my best photos are the ones that happen on complete accident. Just be real. Just be you. And you’ll start to see the best results. This may seem like a weird tip to end with. But this is extremely important and it’s something I wish I did earlier. When you’re taking your own pictures, it’s easy to get stuck in a rut. You’ll have days where you’ll lack creativity. Days when you seem to be taking only bad photos. And days where you realize that your last 3 images were basically the same photo just with different clothing on. That’s where a vision board comes into play. I have a board on Pinterest that just shares some Instagram photos that I really like. Whether it’s the pose, lighting, editing, location. These are photos that inspire me and spark my creativity. Now I’m not saying that you should recreate these photos exactly! Just use it as a source of inspiration. So if you want to create your own Instagram inspiration board, you can use Pinterest like me. Or you could simply use the saved photos section on your Instagram and save the photos that you really enjoy! Now taking amazing photos is just the half of it. 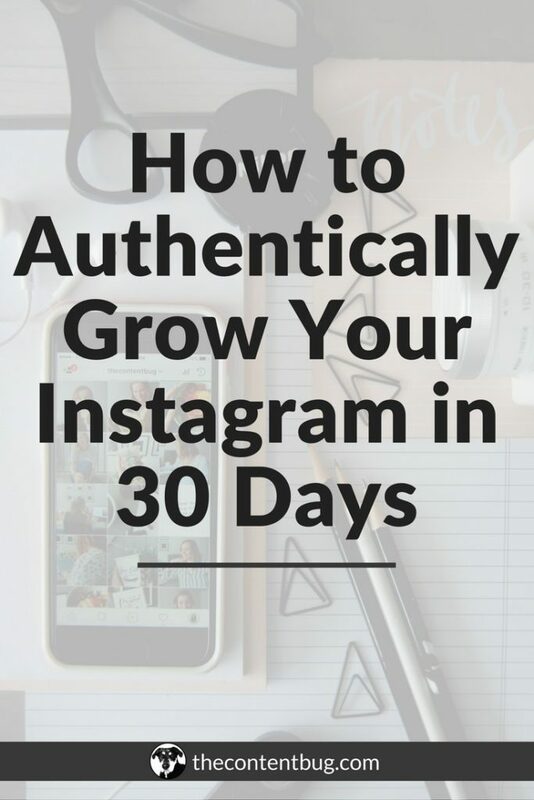 You also have to know how to edit your photos and create a cohesive theme for your Instagram if you want to see amazing results. And I’ve actually filmed a video that goes through my editing process. Check it out! 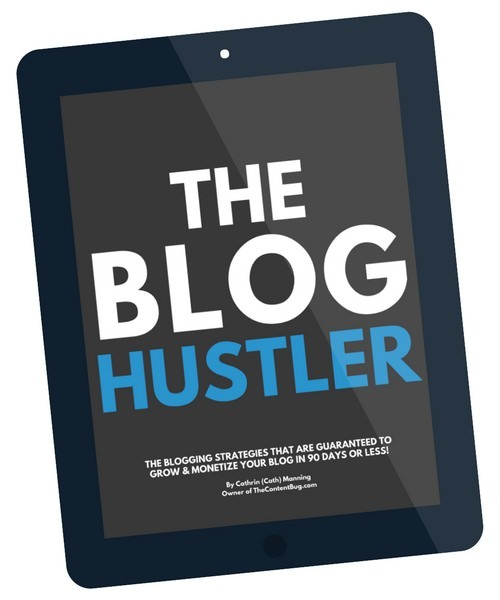 And from there, it’s time to get to work on writing your description, picking your hashtags, and really growing your Instagram account. 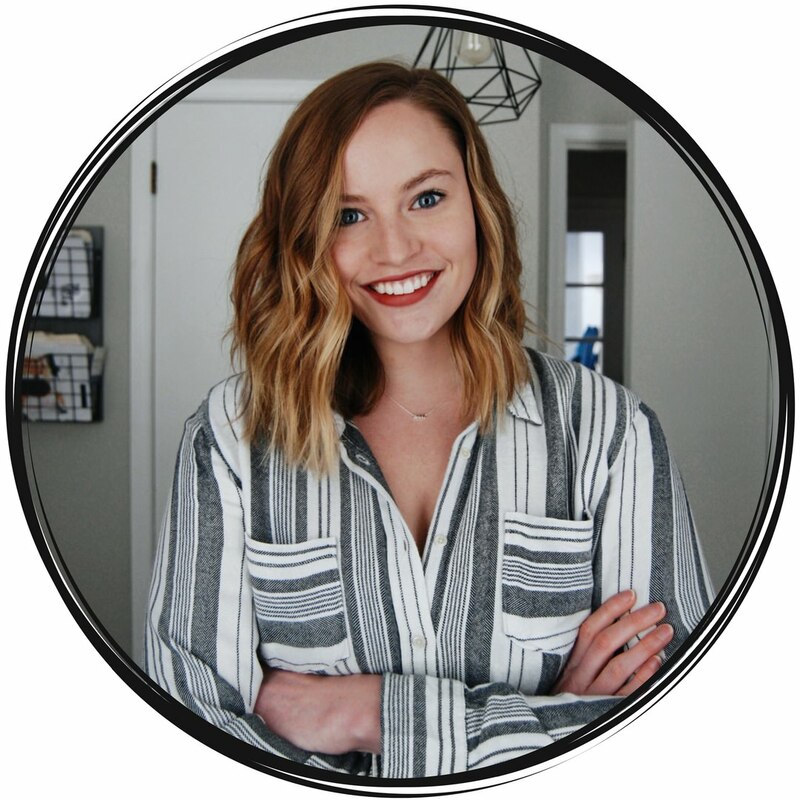 If you’re interested in learning more about Instagram, check out the keep reading section below. And make sure you check out my YouTube channel because I share some pretty important tips there as well!